The Rotary Club of Lowestoft East Point has been awarded the Rotary International President’s Citation for achievements during the year July 2017 to June 2018. 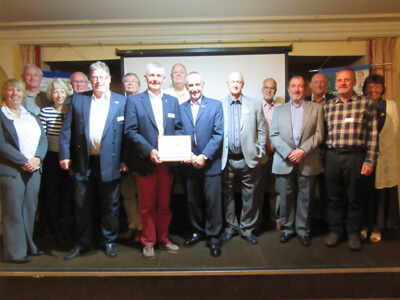 District Governor for that year, Robert Lovick, made a surprise visit to the Club at a recent meeting to announce the award and present a certificate to the Club. The actual Citation will be presented to the Club at the District Conference in Ipswich later this month. The Club was formed in 1998 and has been very active in community projects and fund raising for worthy causes. It is a dual gender Club which meets on Tuesdays at the Hotel Victoria. In July 2017 the Club set itself a range of goals which were in line with those required to be considered for a Citation. During the year the 30 or so members contributed over 1000 volunteer hours for community based projects and fundraising. A Club record of over £25,000 was raised for good causes in the local area and elsewhere. The Club undertook a whole range of projects and made donations to a significant number of good causes. 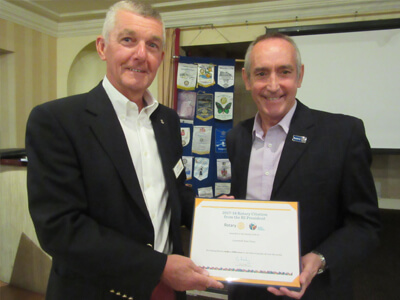 The photos show Robert Lovick presenting Paul Tabiner with the Certificate confirming the award of the Rotary International President’s Citation as well some very proud Club members. For further information on membership please contact Sally Green on 01502 566533.